Charleston Civic Center, located in downtown Charleston, WV, is an indoor events center and arena that opened way back in 1959 but has seen various stages of renovations over the years. The venue is no stranger to the music scene, often hosting concerts from some of country music’s biggest names. Bands and artists that have played Charleston Civic Center over the years include the following: Garth Brooks, Carrie Underwood, Jason Aldean, KISS, The Beach Boys, Black Sabbath, Aerosmith, Lynyrd Skynyrd and AC/DC. This year, the concert calendar at the Charleston Civic Center has a noticeably country angle once again. Musical acts confirmed to play are as follows: Carrie Underwood with support from Hunter Hayes on May 8; Blake Shelton with support from Jana Kramer on September 19 and Keith Urban with support from Little Big Town on December 7. Tickets for all concerts at the Charleston Civic Center this summer can be found right here at SeatGeek. 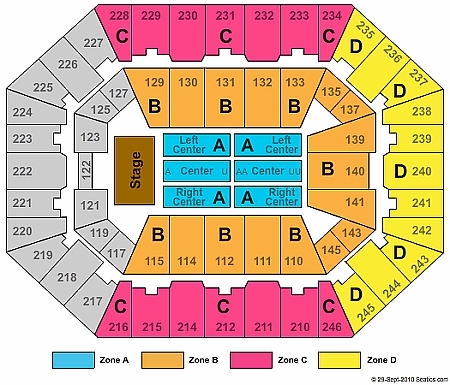 For a look at the seating chart for concerts at Charleston Civic Center, check out the image below.